Significance : Only road border between the India and Pakistan. Attari Wagah Border often known as the 'Berlin wall of Asia', is the ceremonial Border between Pakistan and India is the only road border between the two countries. It lies on the Grand Trunk Road between the cities of Amritsar, Punjab, India, and Lahore, Punjab, Pakistan. It is situated 28 kms from Sikh holy city of Amritsar of Punjab State along the international border, called Radcliffe Line, between the two countries. This border post is the only official road link between the two countries from where people, cargo and vehicles are allowed to cross into the other side. It is also the only land route to approach central Asia also. 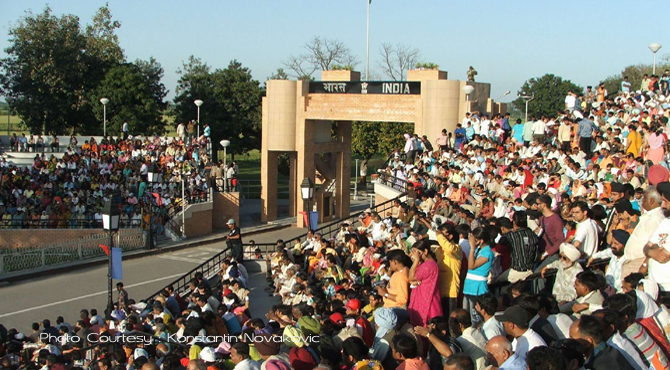 Previously known as Wagah border, it came into existence at the time of India's Independence and partition when the Radcliffe line was drawn, thus distinguishing India and Pakistan, and dividing the village of Wagah into eastern and western parts. The eastern part went to India, and the western part in the newly born Pakistan. It is frequented by hundreds of people every evening to watch the Retreat ceremony at the sunset when gates on both sides are formally closed with an impressive show by BSF (Border Security Forces) on the Indian Side of the Border and Pakistani border guards. The flags of both the nations are lowered and a thrilling parade is performed by the soldiers of both nations. The major highlight is lowering of the flags of the two countries simultaneously and for the flag retreat, the soldiers take the permission from their commanders and march towards the gate at the border. Their march is extremely energetic and passionate, with the feet of the marching soldiers rising almost to their foreheads. The tapping sound that their boots makes is very loud, and is audible at quite a distance. The procession is marked with loud shouts of patriotism from both sides. One can see well dressed, six-seven feet tall, Indian "Border Security Force" soldiers in khaki, and Pakistani "Sutlej Rangers" soldiers dressed in black, taking part in the ceremony. The ceremonies will conclude at sun set with a bugle sound heard together from both sides shows that India and Pakistan are one and at the same time flags of the two nations are retrieved ceremoniously and the patriotic vehemence rises and lights are switched on. On special occasions, liberals on both sides take out candle-lit processions. The spectators remain extremely quite in awe of the ceremony. You can sense the pin drop silence pervading the entire area. As the soldiers of both sides reach the gate, it is flung open. The flags of both countries, flying high at the same height, have to be lowered with full respect and brought back. The soldiers salute each other other and start the flag lowering. The strings with the flags attached are of equal lengths, and the lowering of flags is so immaculate that the flags make a symmetrical "X" at the point of crossing. The flags are then folded and the ceremony ends and the gates are slammed shut. There is a final brisk handshakes between soldiers from either side which is followed by the closing of the gates. At this time, a loud sound of a trumpet announces the end of the ceremony, and the soldiers march back with their respective flag. For the ceremony, one have to arrive before sunset to get a proper seat in an open air theater. There are separate seats for men, women, and foreigners. Cameras are allowed inside but not camera bags and other luggage. Phone networks do not function well in this areas (due to security reasons). Outside the gates, one can get drinks, ice creams etc.